A thousand miles have torn away the softness in my legs, but they still burn. The slope is slanted against them on a mountain rising into the sky. The burn spreads, I slow a step, but march on, cursing my weakness even though I know some mountains are never meant to be easy. Once tall peaks are diminished, falling away underneath me as I rise. The world transforms below me into tiny pieces of a child’s playset. The air thins into a whisper. A single skipped breath leaves me gasping, hunched over, pinned in place. I walk on, burning, desperate for some rhythm to my step no matter how slow. Three hikers far below catch my eye. They are coming, lots of people are coming, but they aren’t here. They didn’t earn the solitude like me. They didn’t struggle deep into the night to reach the trailhead, then deeper still to climb the mountain’s roots. They didn’t sleep on a small perch of dirt and wake up before sunrise. I push them out of my mind. I know they won’t catch me. i know if I burn, so do they. But I know the burn better than they do. It is an old friend saying hello. It is part of me. I embrace it. My eyes lock onto my feet. I count footsteps in rhythm with my breath. Left, right, left, right, left, right. I refuse to look up, to look anywhere but down. The distance to the top doesn’t matter. It is easier not to know, to focus on churning my feet upward. Each step carries into the next. Rocks give way to snow and back again, but I still churn, ignoring it all, conscious only of the rhythm. The air is so very thin. My steps are heavy now. Each feels harder than the last. The world feels steeper. The burn spreads. Everything burns now. Thighs, calves, arms, lungs, they all burn. My eyes stay on my feet. Don’t stop I tell myself. Don’t look. A thousand miles. Haven’t I earned the right to continue unhindered by air or slope or rock or snow? No, this will not stop me. I am too proud for that. I have hiked too many miles, overcome too many obstacles. I can taste it in the air now. The summit is close. It’s almost mine. All mine and mine alone. The other hikers are withering below me. I want it all to myself. I am selfish, selfish for solitude where it is most rare. But I am willing to pay, my body is on fire even as the wind rips away my heat. I refuse to look up. I don’t want to know what remains. The world hangs under my feet for a moment, as if balanced on a peg, then swings flat. My eyes dare to rise. My steps slow, then stop. Not today, not tomorrow, not ever. The trail goes no higher. Mt. 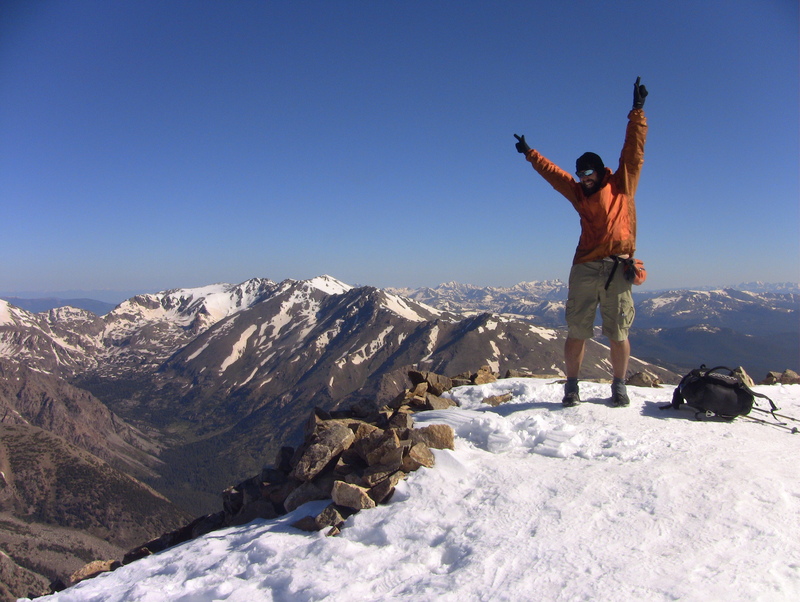 Elbert is the top of the Divide, the highest point between Mexico and Canada. Without wings, there is nothing left to climb. I stand there spinning slow circles, my eyes soak in a sea of mountains under an electric blue sky. Breath returns to my lungs. The burn fades. I raise my arms high over my head, bones and muscles stretching upward, lengthening to touch the morning sky. It is so beautiful. Hours later, near dusk, I look at my watch. Darkness is closing around me. Mt. Elbert has long faded into the sea of peaks behind me, but it cost too much time, too much strength. The road is too far. I pour my food back onto the ground. It’s nearly empty. I think about the road, the town, roasted chicken. I think about the mountain peak in the morning sun, the wind rushing across my face, my arms stretching for the clear blue sky. I smile. Tonight, I feast on memories. Posted in Continental DivideTagged CDT, Colorado, Continental Divide, Mt. ElbertBookmark the permalink.